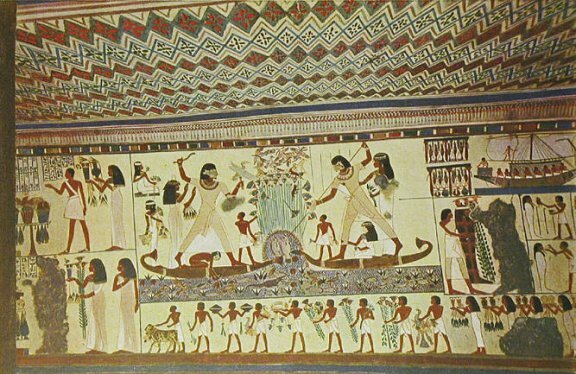 A hunting scene from the Mortuary Chapel of Menna. Menna was a superintendent of the estates of the king and of Amen, at the middle of the 18th dynasty. Menna and his family are seen amongst the reeds in a boat, first spearing fish and then boomeranging birds, which are retrieved by a cat and ichneumon. The boomerang has been carefully cut in two, so that the sport may be spoilt. Butterflies are seen overhead, while in the water fish and crocodiles are shown. Upon the surface, ducks swim amongst the lotus-flowers. There is here a charming figure of a girl leaning from the boat to pluck one of these luxuriant water plants. Farther Menna and his wife are receiving offerings.